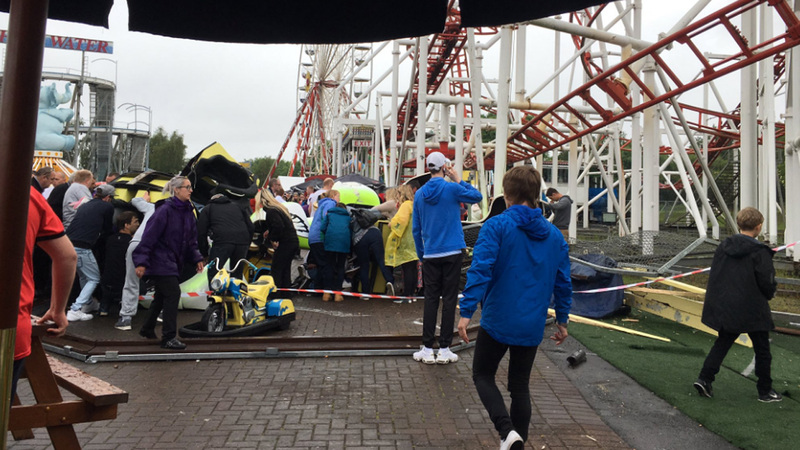 MOTHERWELL, Scotland -- A roller coaster at a Scottish theme park came off the rails today and crashed into a nearby children's attraction, according to BBC reports and posts on social media. At least two adults and nine children have reportedly been taken to the hospital. Lanarkshire, Scotland, police told ABC News that emergency services were responding to the incident at M&D's theme park in Motherwell, about a half-hour from Glasglow. A spokesperson for M&D's said in a statement that "a serious incident occurred at M&D's today involving the tsunami rollercoaster. We have all emergency services on site to assist. The theme park is closed until further notice." The "Tsunami" is the only inverted roller coaster in Scotland and can reach speeds of up to 65 killometers per hour as it goes through corkscrew twists, according to the theme park website. Children under 10 are not allowed on the ride, the website says. The BBC reported that police said seven people were injured, although there was no word on the seriousness of the injuries or the ages of anyone hurt.